Belinda lived in Massachusetts and was the slave of a very wealthy man named Isaac Royall. His family was heavily involved in shaping Massachusetts political and society history. But when he fell out of favor, he fled to another country, leaving his property behind. Sadly, at that time in history, human beings owned as slaves were considered property also. Royall left them to fend for themselves or starve but Belinda decided to stand up for herself and went to court seeking back wages for her 50 years of service. Belinda was born free in Ghana, Africa in or about 1712, but kidnapped at age twelve and brought to America like so many others who found themselves held captive in slavery and wretchedness. She remembered being with her mother who poured out water before the rising sun during a time of worship and prayer. She recalled the beauty of her native land and never forgot the horrifying journey across the ocean in the slave ship which carried three hundred chained and miserable human beings. Belinda spent her captive life in the hands of a cruel man named Isaac Royall who was one of the wealthiest men in colonial Massachusetts. The Royall family lived in Charleston, now Medford, settling there after living Antigua for years. He owned more than two hundred slaves, a sugar plantation and a rum distillery in the islands of the Caribbean. The family was well known in New England and Isaac Royall played a role in the local political scene. When he died, his son Isaac Jr. took over his estate. Belinda continued to work from daylight until dark seven days a week. This man was a staunch Tory when the Revolution began and fled to England when things began to heat up on the continent, leaving his homes and slaves abandoned behind. He mailed a letter stating that Belinda could stay or go free whichever she chose as long as she was never a burden to the town but that Nancy, her infirm daughter would be given away within the year. This supposed freedom was not really a gift because she now had nowhere to live or any idea what to do. Belinda, (who was referred to as Betsey in a letter to friends), had her disabled daughter to care for and no way to accomplish that task. She had no other place to go, was sixty three years old in a time when that was already considered ancient. Despite her unceasing persistence she was unable to establish a secure home for herself and her daughter Nancy though she worked diligently. As the years passed, they fell into ever greater poverty until Belinda took matters into her own hands. She had worked for the Royalls more than fifty years and believed their wealth was in part due to the sacrifice she had made. So this elderly former slave sued the Royall estate for back wages and for funds to care for Nancy. She was now seventy years old. Belinda enlisted the aid of an attorney who wrote and served her dictated letter to the General Court of the Commonwealth of Massachusetts. The year was 1783, and this was a momentous occasion. A former slave had never done dared such a thing before. The letter described her ideal childhood growing up on the gold coast of Africa in a loving home, the darling of two parents. That was contrasted with the abduction, hellish trip over on the ship and her years of service to the Royall, all without payment of any sort. The General Court was persuaded and ordered that Belinda be given a pension of fifteen pounds and twelve shillings per year for the rest of her life. It was an amazing and life changing victory. 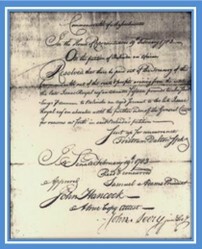 The monies were drawn from the estates and rents of Isaac Royall which had been taken over by the State of Massachusetts after he fled to England. She indeed received the money the first year after the court order but never again and had to repetition the court again in 1787. We have no records showing if Belinda continued to receive yearly payments or if she had to fight for them every year. We do know her courage and self respect left a legacy that inspires and encourages people today. Thank you Belinda for standing up to and conquering a bully. Documents such as slave records and letters from Isaac Royall refer to Belinda as Betsy. She may have changed her name to Belinda or been known by that name only by fellow slaves. Thank you so much. I love the Belinda story so much and would love for her to be known all over the nation for her determination and bravery. Since this is Black History Month, I shared this to my Pinterest board. Exactly, cmoneyspinner. They didn't -and don't-want stories of victory and triumph broadcast. I think Belinda should be in every elementary school child's history book! Thanks for the visit and comments. Hi Kari. I also am forever disappointed and astonished that our history is so censored. People like Belinda should be known by everyone. This case was pivotal and groundbreaking. I am so glad you found this article and learned about this brave lady. Thank you. She sounds like she an outstanding woman with an incredibly inspiring courage to her. I'm kind of upset that I've never heard of her before. Even when there were extra teachings of African-American history during Black History Month in the U.S. when I was in grade school, I can't recall her being mentioned at all. After reading this that really shocks me, since this all sounds incredibly momentous.